1) Do not attempt to come into Crofton directly from the A595, as this takes you though the Crofton Estate Arch. 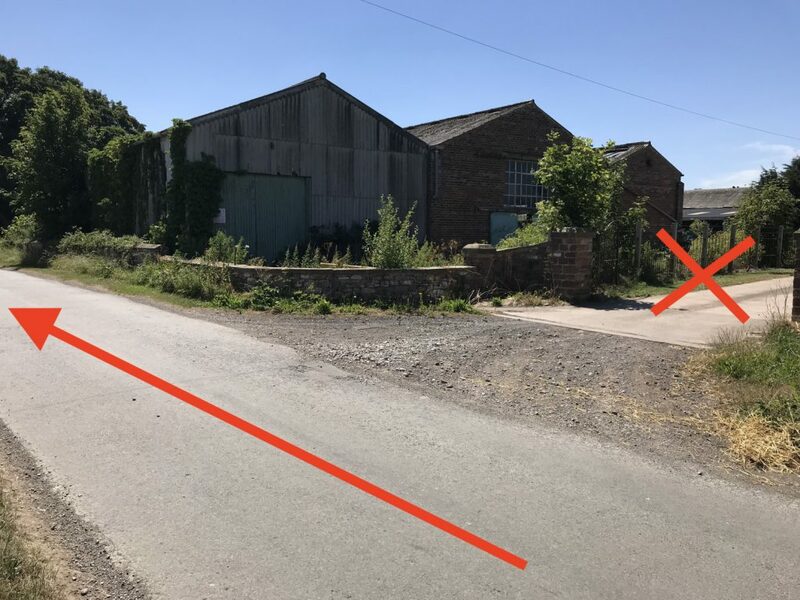 This access from the A595 is both width and weight restricted by law, so if you are in a motorhome of are towing a touring caravan, you will need to access the site from the A596 only. 2) That you do not turn right too early into Crofton Hall Farm. Please read the directions below carefully to avoid problems! When you leave the A596 for Crofton, you will drive 1.25km (0.77 miles) before turning right into West Park. 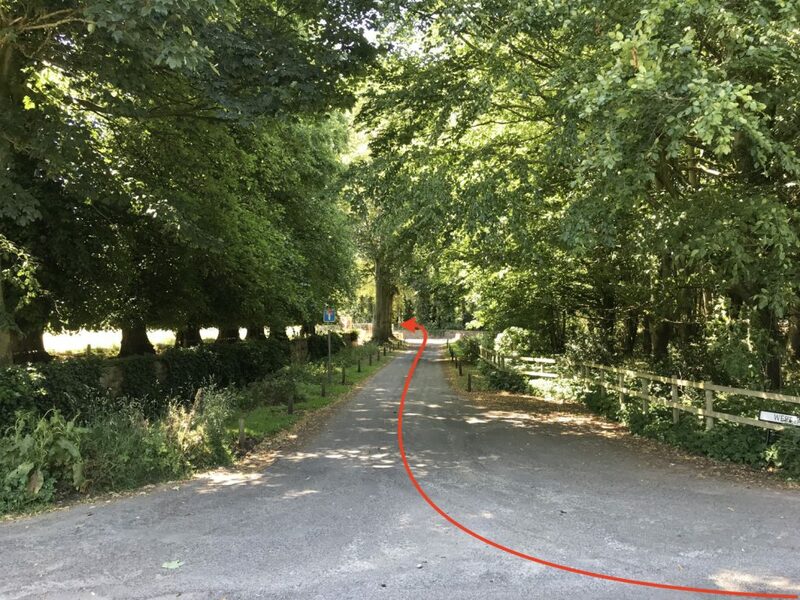 CROFTON HALL FARM – Do not turn in here – it will be very hard indeed to turn around and get back out and this private farm driveway provides no access to the CL site. 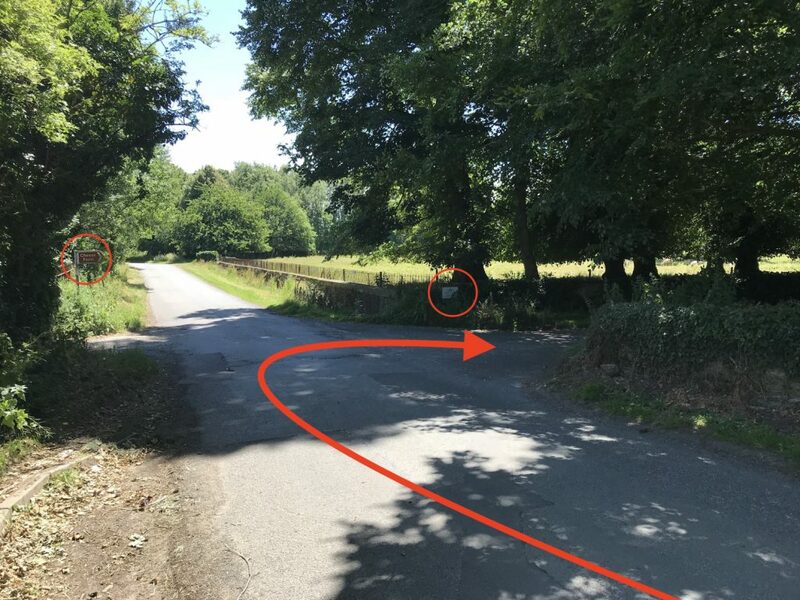 The correct junction, a short distance farther, is marked with a brown tourist sign for the Cheese Farm, circled below on the left-hand-side, and a sign for our site on the wall, also circled, on the right-hand side. Turn into West Park as shown by the arrow. We recommend taking junction 44 from the A74M/M6 and following the A689W Carlisle Northern Bypass, then heading west on the A595/A596. The full route is available on Google Maps by clicking here. Follow the path of the arrow, into West park and then left at the end, into the CL Site. The most direct route is to take junction 41 of the M6 and to follow the B5305. This route can be found here. Many of our customers happily use this route and it is a good road in all but the worst road conditions. This route can be found on Google Maps by clicking here. However, it includes a deep descent and ascent at Sebergham that some may not wish to tackle. The alternative route is to continue to J42 and leave the M6 there. This route can be found on Google Maps by clicking here. Please Note: All these routes have been adjusted from the normal ‘fastest/shortest’ preference on Google Maps to avoid bringing you into Crofton from the east, via the A595. You must approach from the west, via the A596. any queries, please just contact us for help. Copyright © 2019 Crofton Hall Certificated Location. Theme: Zakra By ThemeGrill.